I love this time of year. Thanksgiving is just around the corner and after that, Christmas. In my home, nothing says Christmas like a big batch of homemade cookies, warm from the oven. At My Humble Kitchen, I write about gardening and foods that nourish us from within. So what about cookies? In my family, we eat a bit of everything. Food is not our God, but a blessing from Him. So in moderation, we enjoy sweet treats – especially during this time of year. I have one special treasured cookie recipe that my boys melt for each year. It never seems to fail that when the first snow blankets the earth outdoors, one by one they come asking for polvorones. A special Spanish almond cookie that holds my own memories of my family from Spain. When it comes to cookies in our home, I like to make them using natural sweeteners like honey, maple syrup, or whole cane sugar, which contains beneficial nutrients such as minerals and vitamins. Since I’m so excited for the holiday season and the launch of my new eBook, I’m going to share with you a simple to make no bake cookie recipe that my boys adore making with me… No Bake Coconut Snowballs. These cookies only take about five minutes to make and taste just like candy when covered in melted chocolate. They’re lovely to make for family gatherings or to fill in tins for cookie exchanges. Place 1 cup shredded coconut and 3 tsp coconut oil into the bowl of a food processor. Process on high speed, scraping down the sides every once in a while until it reaches a butter consistency. 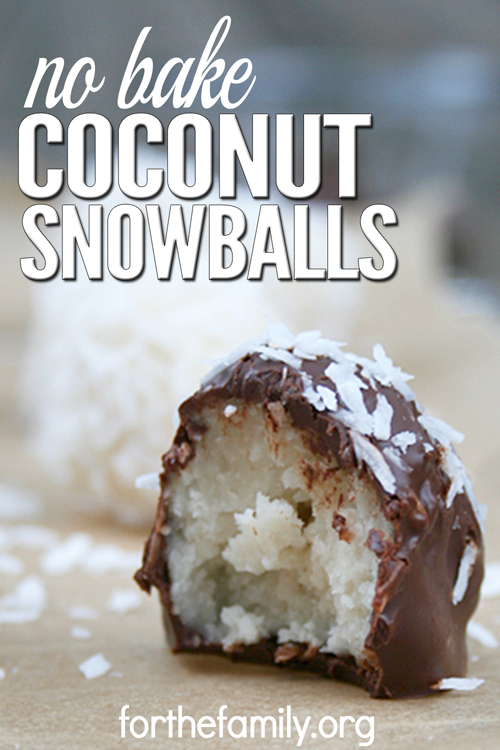 If you’d like to make these extra special, omit the final coating of shredded coconut in step 4 above. Allow the shaped coconut balls to firm up in the refrigerator, preferably overnight. Once the coconut balls have firmed up, melt the dark chocolate in a small saucepan over medium heat. This should only take a minute or two. 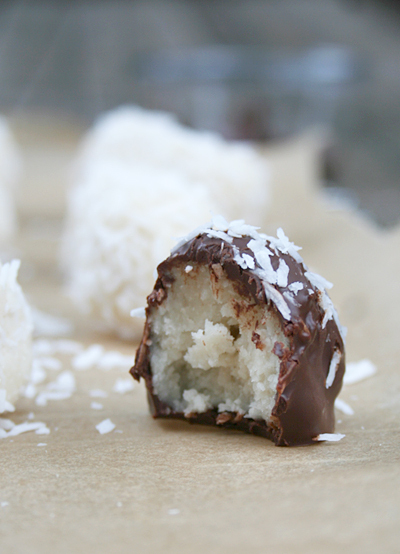 Once the chocolate is melted, dip the coconut balls into the melted chocolate and sprinkle them with the shredded coconut. 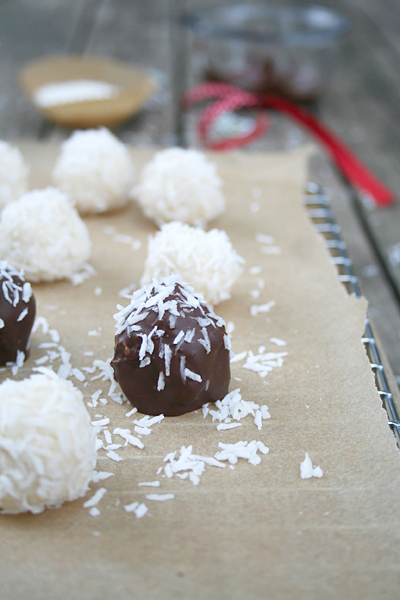 Allow the chocolate to harden by placing the coconut balls back into the refrigerator for 5-10 minutes. These cookies only take about five minutes to make and taste just like candy when covered in melted chocolate. They're lovely to make for family gatherings or to fill in tins for cookie exchanges! What are your favorite Christmas Cookies? Please share any recipes with us in the comments below. I know you’ll like these, Mare! These look great! Every since I was a little girl, I’ve had the unhealthy version of these at Christmas. My husband loves them. I’m definitely going to try this healthy version! Thanks for sharing! Let us know how they turn out, Tara! Takes more than 5 minutes. is the maple flavor noticeable? Is there any substitution that you would recommend trying? They sound amazing! We grew up with a different version & they were always my favorite! How can I make these without a food processor? I do have a hand mixer. Thank you! I love to cook, and my husband would love these, I just don’t have the equipment many recipes call for today. Thanks again. Are you talking about the coconut milk in the carton in the refrigerated section? Or the kind that comes in the can in the Asian section? These look great. I prefer using rice malt syrup as it is fructose free. Would I be able to substitute the maple syrup for rice malt syrup? And would it be the same quantity? My 1/2 TBLS. measureing spoon was the correct diameter and it made 23 snowballs. Into the freezer they go! These are great for a gluten free husband. Thank you Xmas greetings from New Zealand Vonnie. These are so good! I rolled mine in a little almond meal. Delish. Thanks for the recipe. These sound utterly delicious – can’t wait to make them for myself. This recipe has the 2 things I love the most! Coconut and dark chocolate! My favorite cookie is a white chocolate apricot recipe. It’s very simple, but AWESOME! Thank you for posting this recipe. God bless you and yours. These will be added to my cookies that I make for my husband’s siblings. They will be a great addition. Thanks for sharing, they look wonderful! Going to give them a try this year. Could you post a picture of maple syrup? Or do you know the name for it in Spanish?? 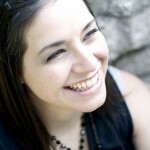 Maple syrup is a very North American thing… in the spring the sap from maple trees is boiled down and made into a syrup. You could probably use agave as suggested or honey. I want to make some this sunday for christmas which is two weeks away. My question is: can they be frozen and for how long? Diana, the original poster seems to be out of the office for the last two years, unfortunately. It would be nice if someone could reply for her, or explain what happened to her. Wonder if this would work with some rice Christies in it? And milk chocolate not dark chocolate? when buying coconut oil do I buy solid or liquid. coconut oil is a solid and become a liquid at over 70 degrees. Nutiva ia a great tasting brand. Costco also sells it. I use it for all my cooking oil needs. Buy solid. It melts but will harden again when cold. I assume the dark chocolate is sweetened? Is there any reason that you could not use carob? These look awesomely delicious. Would regular milk work as well? I made these for Christmas as candy. I substituted honey for the syrup and heavy cream for the coconut milk. They were then dipped in dark chocolate. Yummy. Thanks for the recipe . …I’m about to make more. Also, they keep well in the freezer. 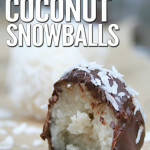 These are really good too with 1/2 maraschino cherry in the middle of the coconut ball. Drain cherries and color with juice if you like. Hoe many balls will this receipe make? Oh Heavens! These are delicious. I made them for my Mum’s birthday coming up. I’m really going to have to put them somewhere safe. Safe from ME! Thank you for posting this recipe. Amazing! Have made them twice now. Big hit with adults and small kiddos here 🙂 Thanks! Hi, just so I can put this in a calorie counter, how many snowballs will this make? good questions, Jennifer. I’d love to see the answers also. Diana? I did liquid state for coconut oil. And I used coconut milk, if using canned make sure to mix well first. When it says Maple syrup It Means maple syrup, not maple extract. My eyesight is not as great as it could be. Had to through the whole batch away. yummy, healthy and so easy! thanks. Is there any substitution for the unsweetened coconut milk? I made these last night but I have to say I was not excited. Very bland.They look great but the coconut filling is bland. I don’t feel they were bland, I used unsweetened coconut in the balls and natural sweetened coconut to roll, because that’s what I had. Turned out great. Love that they are low sugar, no dairy, gluten free. Do you think I could use honey instead of maple syrup?? I don’t have a food processor. Is there any other way to mix them to the right consistency? God Bless you Precious. Thank you for honoring God in all you do. We all need to show our affections for Him. I love to.